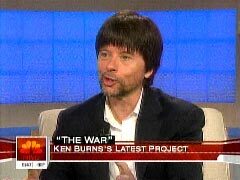 In Time: PBS Star Ken Burns Bashes Bush, 'Extreme Rightward' Court Tilt? "People yearn for the memory of shared sacrifice that the Second World War represents," Burns says. "Now we're all free agents. We don't give up nothin'. We were asked after 9/11 to go shopping. It was sort of 'Don't worry your pretty little head about it.'" What's with the popularity of this "We were told 'go shopping'"? Is Burns stealing lines from Susan Sarandon, or this just part of the liberal talking points? Yes, the President urged us not to let the economy tank, but he didn't say "don't worry your pretty little head about it" in any way. Turn the page, and quickie reviews of new products included a review of CNN legal analyst Jeffrey Toobin's new book on the Supreme Court. Wrote Time's anonymous blurb-composers: "With stylish writing and unparalleled access to the Justices, he explores the Judicial Branch's recent extreme rightward trajectory. His conclusion? The John Roberts court is on the move and gunning for precedents."